The English Bull Terrier is instantly recognisable by its egg shaped head, deep set eyes and animated gait. Often described as a fun-loving and clownish, it’s a loyal and obedient dog that becomes very attached to its owner. This breed requires firm leadership and a lot of exercise as they tend to be destructive if they are bored. Originally bred as a fighting dog, they are much gentler today, but will protect their owner if the situation arises. English Bull Terriers are divided into two colour classes; the White Bull Terrier and the Coloured Bull Terrier. The White Bull Terrier may only be all white, but is allowed to have coloured patches on its head, whilst the coloured Bull Terrier may be brindle, black, black/brindle, red, fawn or tri-coloured. There are many examples of the breed being tri-coloured with white markings. An English Bull Terrier is easy to groom and requires no coat clipping. They shed very little – usually only twice a year – so only need a weekly grooming with a rubber brush or special glove. Not every owner wishes to clip a Bull Terrier’s whiskers, but if you choose to, do so every two months with blunt nosed scissors. Feeding them high quality pet food containing oils will help keep their coat in top condition. All English Bull Terrier puppies should be checked for deafness, as this occurs in one in five white bull terriers and about one in 100 of coloured dogs. Some Bull Terriers may also develop an allergic reaction to insect bites, such as fleas, mites or mosquitoes, so you should do what you can to keep your pet from coming into contact with them. This breed requires a lot of exercise and is prone to putting on weight if it doesn’t get it, but exercising a younger dog too much will over strain its muscles. As it is a short haired dog, any white areas around the nose, ears, eyes, mouth, hindquarters or stomach must be protected with a gentle, high factor suncream to prevent burning when taking it out in the sunshine. It’s amazing to think that this gentle, playful breed was once bred as a fighting dog. However, they still crave firm, unwavering leadership and you must be the pack leader at all times lest they become stubborn, overly protective or jealous. They are a great family pet and will join in on any roughhousing or playtime, so it’s important to teach your children to display leadership towards your English Bull Terrier. They require lots of exercise, and if they do not get it they may prove too energetic for younger children. As long as they are socialised well, English Bull Terriers will get on well with other dogs and household pets. They are recommended for an active family who can give them lots of companionship as they will become bored if left alone all day, resulting in destructive tendencies. English Bull Terriers are intelligent, have a big personality and may be wilful, stubborn or mischievous. Training should be motivated by food. You must be patient, handle them firmly and give them lots of praise. 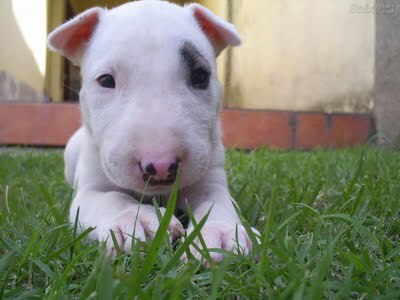 Bull Terrier pups can be boisterous, and they should be taught not to jump or nip when taking something from your hand. As with any pup, when housebreaking your English Bull Terrier it should be given constant access to the correct place to relieve itself and confine it so it does not mark the wrong places. They are best socialised when they are between 7 weeks and 6 months old, but you should avoid leaving it over 9 months as their attitude to other people and dogs might not be changed. With the right training program, they will be a wonderful addition to your family. English Bull Terriers have energy to spare, and require a lot of exercise. Long, daily walks are a must, and they are more than happy playing with your children in the back garden or park for hours on end. Balancing their food intake with their exercise is important as they have a tendency to put on weight if they are not active. In the 1800s, the ‘Bull and Terrier’ breed was cultivated to control vermin and satisfy the demand for animal based blood sports. 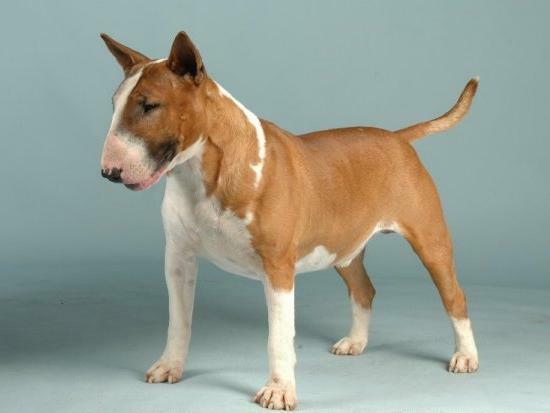 Around 1850, James Hinks began breeding Bull and Terriers with English White Terriers in an effort to develop a more elegant appearance with stronger legs and a more aesthetic head. In 1862, he entered a female dog called ‘Puss’, sired by his white bulldog ‘Madman’ into the Bull Terrier class at the Chelsea Dog Show. 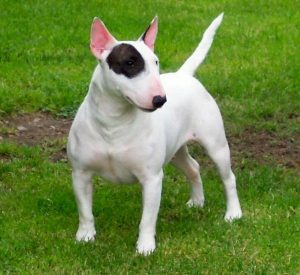 Then known as the ‘White Cavalier’ or the ‘Hinks Breed’, these dogs did not yet have the familiar looks of the English Bull Terrier as they kept the ‘stop’, or the point on its face where the snout begins. The dog became instantly popular, and its characteristics were further refined by introducing Greyhounds, Dalmatians, Foxhounds, Spanish Pointers and Whippets into its breeding to increase its agility and elegance, and Collies and Borzois to reduce the stop. The first modern English Bull Terrier is recognised as being ‘Lord Gladiator’, as it was the first with no stop. Hinks only ever bred white English Bull Terriers, and in an effort to reduce the risk of congenital defects such as deafness, colour was introduced by cross breeding them with brindle Staffordshire Bull Terriers, which were efficient ratters, herders and guard dogs. In Turn, English Bull Terriers contributed to the gene pools of the Japanese Tosa and the Dogo Argentino. Hinks also wanted to breed some behavioural characteristics into English Bull Terriers. He always thought of the breed as a ‘gentlemen’s companion’ rather than a fighting dog, able to socialise with other dogs and children. Unfortunately, English Bull Terriers were entered into fights, meeting with much success. In fact, until 1895, the ears of the English Bull Terrier were closely cropped to the head to avoid injury in combat. 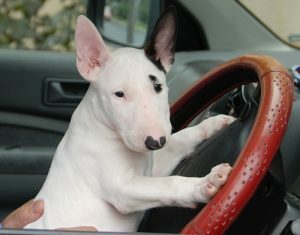 With their distinctive looks, English Bull Terriers are very photogenic, and are often seen in adverts and TV shows. 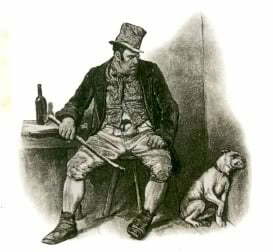 Notable examples of famous English Bull Terriers are Bodger, a character in the film Incredible Journey and Bullseye, Bill Sykes’ pet in Oliver Twist. Mohammed Dushti, you complete tool. If you want a 3 week old dog, you should never be allowed a pet. They should NEVER leave their mum before 8 weeks. You are an irresponsible, idiotic and completely clueless bloody foreigner.